It’s almost time to dig out your gear, slap on some board wax and head towards one of Mono County's winter gems. Yes, we are talking about June Mountain. 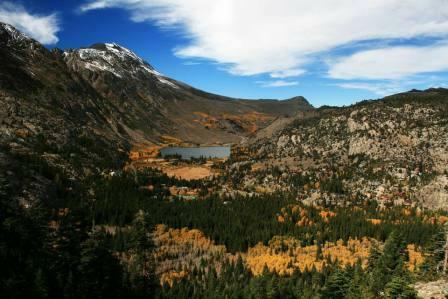 Located in June Lake, it is 500+ acres of pure skiing nirvana. Word has it that the mountain will reopen to visitors on December 13th. With that said, consider starting your day at 8 a.m. with a chair lift ride to the June Meadows Chalet. It’s a great place to survey the breath-taking mountain views over hot coffee and palate pleasing muffins. It will also give you time to come up with a game plan. The mountain itself features a 10,090 foot summit elevation, a vertical rise of 2,590 feet and 35 named trails to choose from. If you have skiing skills on par with Lindsey Vonn and Bode Miller, the expert trails may prove to be your best bet. They include Gulf Canyon and the Powder Chute. Of course not all of the trails are geared towards experienced skiers. There are beginner and intermediate tracks too. There is also an award-winning terrain park on offer. You may have read about the park several times in TransWorld Snowboarding magazine. In 2012, it was listed in three of the magazine’s Top 10 categories (resorts, parks and pipes). If you do decide to head towards the terrain park first, be sure to hit the super pipe. It will have you feeling like a young Travis Rice, Shaun White or Kelly Clark in no time. Once you’ve had your fill of super pipes and powder, contemplate capping off your day with dinner. There are several places to dine in the area. One of them is the Double Eagle Resort and Spa. They frequently serve such flavorful delights as lamb chop lollipops, trout piccatta, filet mignon and veal osso bucco. If you want lighter fare and family fun, try The Tiger Bar & Café instead. They feature a children’s menu and onsite entertainment. Down home, scrumptious foods on offer include country-fried chicken, meatloaf, pork chops, top sirloin and the renowned Tiger Burger. To learn more about Mono County’s winter gems, please contact us at (855) GO-MAGGIE or “Like” our Facebook page. We’d love to talk further about all of the great things to do in our area.